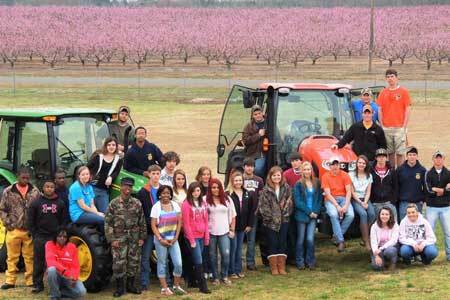 The Strom Thurmond Career Center Agriculture Department along with the Edgefield County Young Farmer Association held the 1st Annual Edgefield County Agriculture Day on Saturday March 16, 2013, on the campus of Strom Thurmond High School with an estimated 1500 in attendance. The event highlighted the local agriculture industry in Edgefield County with exhibits from several of our leading industries including the peach, the timber, the horticulture, and the livestock industry. The event also featured an antique tractor and equipment show, agricultural demonstrations by Piedmont Technical College and Clemson University, an equipment display area with new tractors from Derrick Equipment and Wilson Tractors, and a live petting zoo with miniature horses, goats, chickens, a rabbit, a calf and a hunting dog named Pete. In addition to the agricultural displays and demonstrations the festival also featured a silent auction, barbeque pork for sale, a farmers market, and several inflatables and games for children of all ages. All proceeds from the event will be used for several agricultural related scholarships for students as well as help fund the agriculture program at Strom Thurmond. 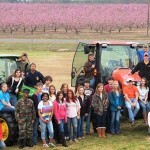 One Response to "Ag Day Spreads Community Awareness of Agriculture"